Roufus won his IKF Pro Muay Thai World Title on December 4th, 1998 in Milwaukee Wisconsin, USA over Hiriwa TeRangi of New Zealand unanimous decision 50-43 on all 3 judges cards. On March 19th, 1999 in Milwaukee Wisconsin, USA in his only defense of the title, Roufus quieted all the critics by starting hard and fast and then landed the "A Bomb" on Australia's WKA World Champion Grant "The Bomber" Barker. In a combination which included a leg kick, 2 knees to Barker's head and finished with a high head kick. Roufus only took 39 seconds to Knockout the Australian in the opening round of the scheduled 5 round Muay Thai bout. 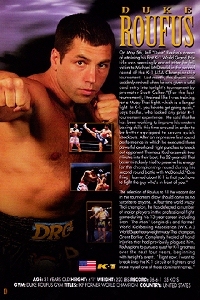 Roufus Voluntarily vacated his Super Heavyweight Title to move DOWN to the Heavyweight Muay Thai Division. He later retired. However, at the end of October, 2000, Roufus announced he would come out of retirement to fight in the K-1 USA. 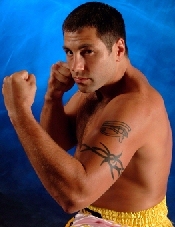 He lost his second round bout in the May, 2001 K-1 USA and his opening round bout in the August K-1 USA. 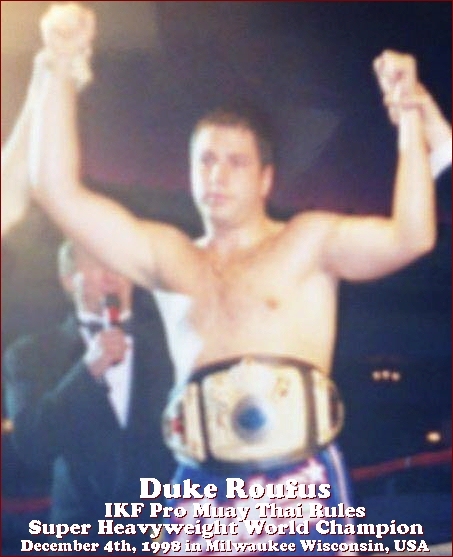 On December 11th, 2002 Roufus made his retirement official due to his busy schedule with promoting his own events and other work. His final fight record was 36-8-1/26 and in pro boxing he was 2-0/1. 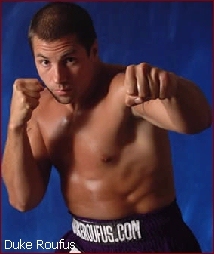 On June 3rd, 2005 Roufus came back to the ring to fight one more time defeating Sinisa "Thunderman" Andrijasevic of Split, Croatia by unanimous decision, 48-47, 50-45 and 49-46. On May 5th, 2007 Roufus stepped back into the ring again, fought and defeated Brazil's Eduardo Maiorino	by TKO (Leg Kicks)	at :56 seconds of round 2. Following his retirement, Duke become an accomplished trainer, working with many UFC/WEC stars including UFC Lightweight Champion Anthony Pettis, Alan Belcher, Pat Barry, Erik Koch, Ben Rothwell, Matt Mitrione and former U.S. Olympian and former Bellator World Champion Ben Askren. Former students include former UFC Lightweight Champion Jens Pulver and The Ultimate Fighter Season One star Stephan Bonnar. Following his retirement, Duke Roufus became one of the most recognizable MMA and striking coaches in North America, and is considered to be one of the top trainers of Muay Thai kickboxing outside of Thailand. Roufus also runs the Roufusport Fight Club team, which includes UFC stars Anthony "Showtime" Pettis (the last ever WEC World Lightweight Champion), Alan "The Talent" Belcher, Erik "New Breed" Koch, Chico "King" Camus, and Germany's Pascal "Panzer" Krauss, in addition to Olympic wrestler and Bellator Fighting Championship Welterweight World Champion Ben "Funky" Askren. Former students include former UFC Lightweight Champion Jens Pulver, The Ultimate Fighter season one star Stephan Bonnar, and UFC veterans Pat Barry, Matt Mitrione and Jesse Lennox. 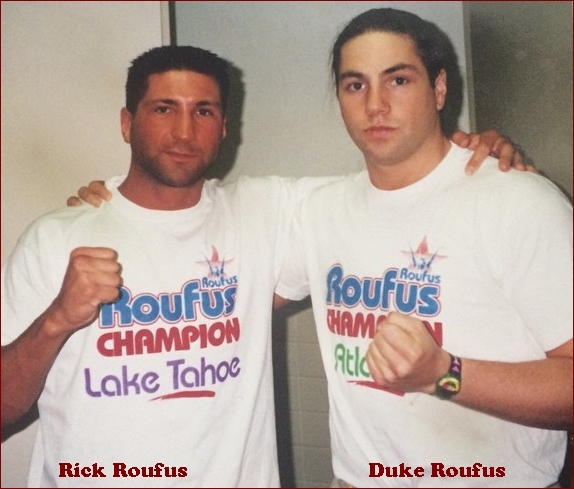 Duke Roufus and business partners Scott Joffe and Anthony Pettis operate Roufusport Martial Arts Academy in Milwaukee, Wisconsin, USA. Roufus and Joffe also produce North American Fighting Championship live combat sports events in the U.S. and Canada. 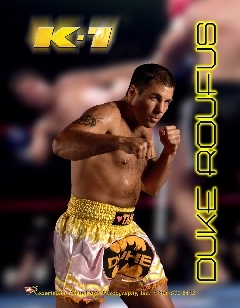 Roufus has also served as color commentator for K-1 on ESPN2 and has appeared on TSN in Canada, Walker Texas Ranger and Fox's Best Damn Sport's Show Period. In January 2003, he was named one of Milwaukee Magazine's "50 People You Should Know." Started Martial Arts training age 4. 3rd degree Black Belt Karate. 1991 WAKO Bronze Medal Continuous Contact-London, England member of WAKO US Team. Kickboxing under Pat Roufus, former PKA referee & head of Fight sanctions, founder of Roufus Kickboxing. Muay Thai training experience at Sityodtong Camp, Fairtex MuayThai Camp, Master Toddy MuayThai Camp and Phetnoi MuayThai Camp trainers. Amateur Boxing under Israel Acosta-US Olympic coach. Pro Boxing under Stan Johnson, trainer of former WBC Middleweight Champion Gerald "G-Man" McClellen & former WBC Continental Americas Cruiserweight Champion Rick 'The Jet" Roufus. Trainer of 17 IKF National Amateur Champions 1999-2001. Trainer of 1999 WMC World Amateur Heavyweight Champion. Coach of the Most Champions at IKF 2001 National Tournament. Coach of 2001 Wisconsin Golden Gloves Light Heavyweight Champion. Coach of 2001 Chicago Golden Gloves Women's Middleweight Champion. Consultant for K-1 North America. 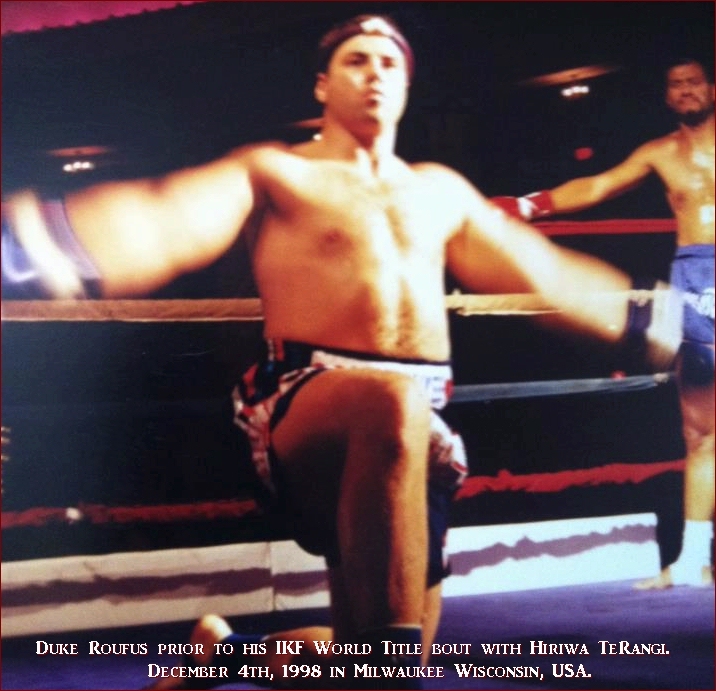 Featured in Instructional video series by World Martial Arts - "Duke Roufus MuayThai Kickboxing." AND The WKA North American Super Heavyweight Champion. Fought & coached world-wide: Japan, Australia, France, Thailand, Italy, Belgium, Belarus, Canada, England, Brazil, Puerto Rico, & Germany, The Bellagio Casino and The Mirage Casino, Las Vegas, NV, Caesars Palace, Lake Tahoe, NV, Foxwoods Casino, Ledyard, CT.
2000 IKF Promoter of the Year. 2001: Acted on the show "Walker Texas Ranger" with Chuck Norris in an episode aptly named "Legends". May 2002: Appeared on FoxSports "Best Damn Sports Show". Served as a color commentator for K-1 Kickboxing on ESPN2 and for KOTC on TSN in Canada. Trained Dustin Diamond, also known as "Screech" on the 1990's show "Saved by the Bell" for FOX's Celebrity Boxing. Diamond won the match by knock out, by the way. 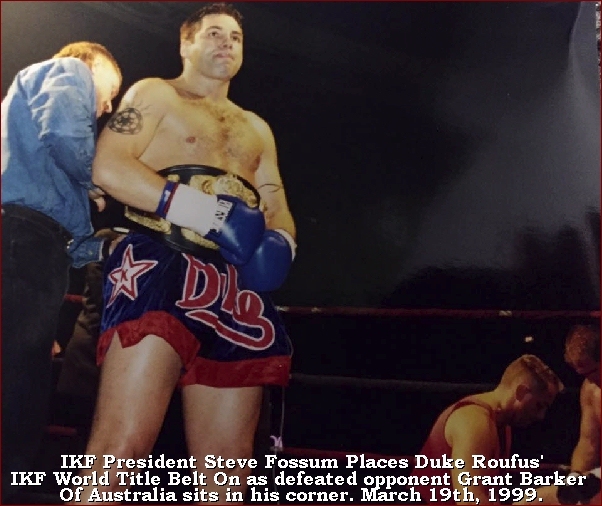 IKF Australian Representative and Trainer Robert Wilesmith (L) with Grant Barker (C) and Duke Roufus (R). 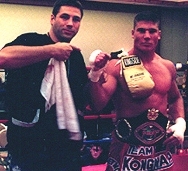 The photo was after Barker lost by a head kick KO to Roufus on Roufus' defense of his IKF Pro World MuayThai Super Heavyweight Title in Milwaukee Wisconsin, USA. Roufus retired the Super Heavyweight title in September of 1999 to move down in weight but never fought for a title there and eventually moved back up to Super Heavyweight before he retired. 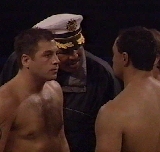 Duke and his brother Rick at one of Rick's World Title defenses in Atlanta, GA in 1992.